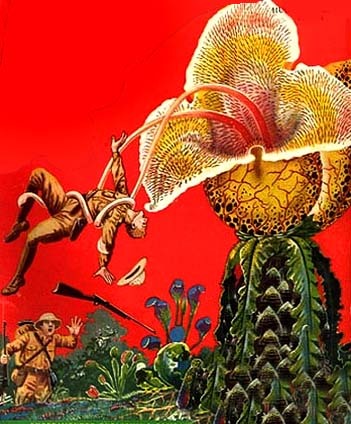 Science Fiction and Fantasy Reading Experience: Frank Belknap Long "The Horror from the Hills"
Frank Belknap Long "The Horror from the Hills"
A rare and interesting collection from the master of weird fiction. 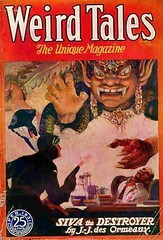 In the US it was strangely titled "Odd Science Fiction", published in an obscure paperback without mentioning that the title novella originally appeared in 1931 "Weird Tales"; at least in England it was properly titled "The Horror from the Hills". 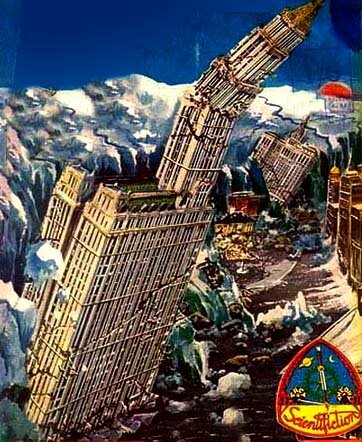 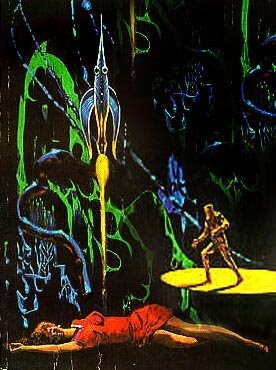 Frank Belknap Long - The member of the Lovecraftian school of the weird and macabre tales, highly visual and entertaining writer, though the quality of his output declined with the demise of the pulps. 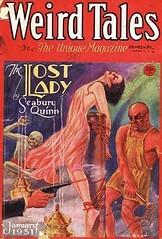 During the pulp era, however, his stories were highly entertaining, thrilling pieces. 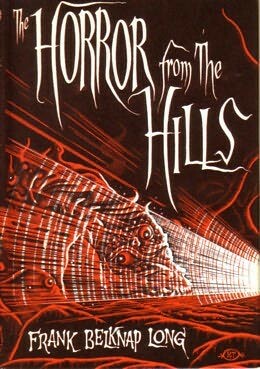 When I started to read "The Horror from the Hills" I was expecting a great deal of vintage Lovecraft-ian atmosphere and wide-eyed sense of wonder (it was published first in "Weird Tales" in 1931), and the story lived up to all these expectations, and more. 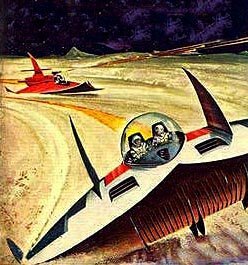 Technically, it is science fiction as well as fantasy, as it rationalizes its thrills as travel between multiple dimensions by means of some intimidating machine. 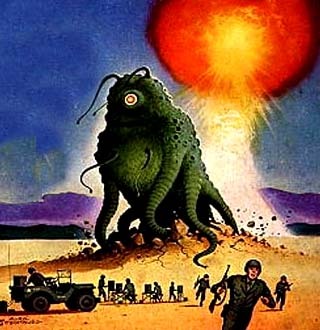 "Unspeakable" and "unmentionable" beings (all decked out in a true H. P. Lovecraft's descriptive style) abound in this novella, flaunting their blob-like, octopus-like and living hills-like manifestations - all wrapped up in a greatly entertaining mix. 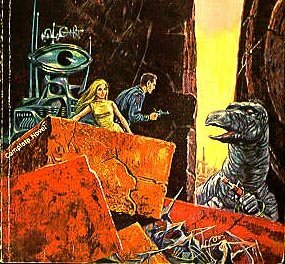 A blob-buster indeed, from the golden period of "Weird Tales": ancient mysteries, horror in a museum, mad scientist with his multi-dimensional machine, spectral "Others" haunting past and present, hills come alive... A classic. 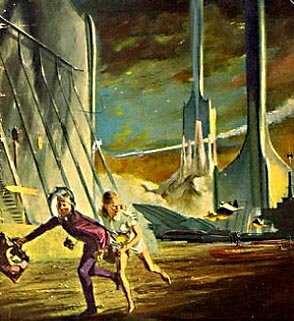 Very cool story, very romantic - a flame of love versus the kind of radioactive mysterious glow from space, enveloping the ex-astronaut. 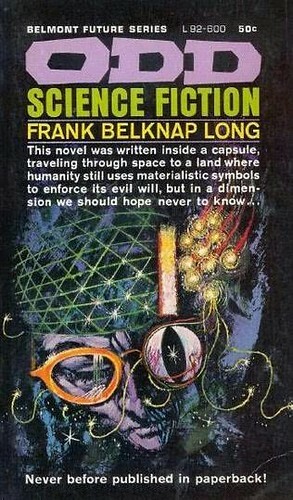 Frank Belknap Long is a ticket to solid, highly visual pulp entertainment. 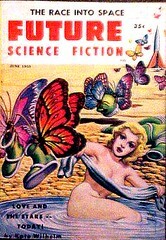 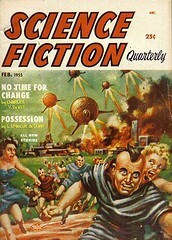 An unexpected and rare treat from the sadly declining days of good old "Future" pulp magazine.